Photo: Courtesy of Jason Sobocinski/Caseus Fromagerie Bistro, New Haven. It’s our grilled cheese-paloza! This week, we celebrate everybody’s favorite sandwich, from classic to crazy. New Haven’s own cheese expert, Jason Sobocinski, of Caseus Fromagerie Bistro, joins us for a fun conversation about grilled cheese (and more!). 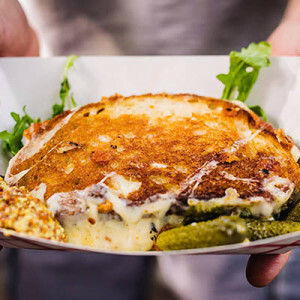 Chris Prosperi serves up a breakfast grilled cheese, and Heidi Gibson, the author of Grilled Cheese Kitchen, shares tips for great grilled cheese, along with recipes for over-the-top twists. We’ll also sip a value red wine born to pair with cheese, and a fresh-tasting Mexican bloody Mary you’ll want to drink along with your favorite grilled cheese.